February is the shortest month, but its fun celebratory days make up for its brevity. The second month of the year is home to Valentine’s Day, the Super Bowl and Mardi Gras. The last of those holidays is arguably February’s most joyous occasion. According to the History Channel, the annual celebration was originally conceived as the last day before a 40-day fasting period. People would indulge in their favorite delights before giving up the treats until Easter. Fat Tuesday is now mostly viewed as a day of revelry, and many Americans flock to New Orleans, Louisiana, to celebrate. Mardi Gras falls on February 12 this year, and small business owners should participate by holding themed events in their establishments. Fun celebrations pique consumers’ interests and motivative them to visit local companies. The Houston Chronicle recommends holding Mardi Gras-themed promotional giveaways to capitalize on the holiday’s popularity. Consider the following tips when preparing a giveaway for Mardi Gras. Fat Tuesday is one of the most colorful celebrations in the world. Unlike other holidays that traditionally use one or two colors, Mardi Gras is associated with the entire rainbow. The Houston Chronicle writes that the most popular colors are green, yellow and purple, but other hues are common sights at most celebrations. Small business owners can distribute unique promotional products that include all of Mardi Gras’ colors. Purple pens, green magnets and yellow USB drives would make great gifts at the events. Customers appreciate when small businesses include a holiday’s major themes with their advertisements. Additionally, small tins of candy should be distributed to patrons so they can celebrate before giving up sweets for the fasting period. The colors should also be used around the establishments to create a major Mardi Gras celebration. Signs and banners should be hung outside to attract passersby. The bright decorations will be eye-catching, especially in areas where there are not many events for Fat Tuesday. A special contest should be the centerpiece of every giveaway on February 12. Customers love being able to win small prizes, so small business owners should hold drawings and offer awards. Personalized business gifts like custom pens and mugs will motivate consumers to participate in a contest. The Houston Chronicle recommends requiring customers to submit their contact information upon entry. Small business owners should exercise restraint to gain the optimal number of contestants. Consumers are nervous about sharing personal information because of the recent rise in identify theft. Local establishments should only ask for names and addresses. The information can be used during future direct mail marketing campaigns. Entrepreneurs should explain that the gifts have to be ordered and cannot be distributed at Mardi Gras. The prizes should be mailed to the winners as soon as possible. If there is a significant delay, consumers could believe that they were scammed. A Mardi Gras celebration is not complete if employees are wearing their everyday uniforms. The news source writes that owners should require their staff members to wear costumes so customers feel like they are in New Orleans for the big day. Small masks and beads should be worn by every worker. 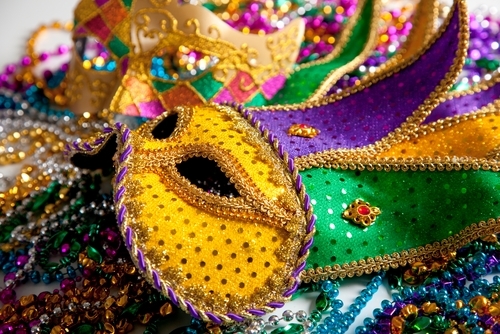 The small accessories add a great deal of authenticity to Mardi Gras-themed giveaway. Employees should be encouraged to customize their outfits and have fun during the event. Mardi Gras is an excellent marketing opportunity for small businesses. AZ Central writes that the holiday breaks up the lull between New Year’s Eve and Easter. Owners should capitalize on Fat Tuesday to attract new revelers who might become loyal customers if they win the contests.